Happy Day After The First Day of Spring! It's rainy and damp here in Philadelphia, which frankly is annoying because geez Louise has it rained a lot this year! I like some rain here and there, and love a rainy day when I'm at home and can be extra cozy, but why has it rained so much, and not at all in other places??? It's just one of the many things that would change in a Bridget-centric world. Seems like a lot of knitters/knit podcasters are traveling to Edinburgh for the Edinburgh Yarn Festival, which would be nice, because a) Scotland, and b) yarn. But as life would have it, I will be only traveling this weekend to My Stash, as it is that time of year when I do a review/cleanout. So my trip will be to a) Philadelphia and b) the third floor of my house. The best thing is that I don't have to spend money or even talk to anyone, so I guess it's all good in the end. 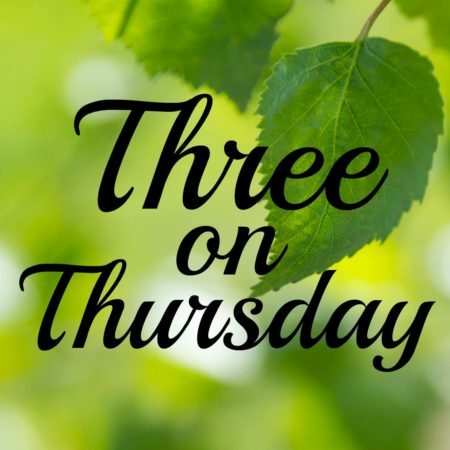 Today is Three on Thursday, so I thought I would share a few of my favorite things in three different categories. These are of course, just a few that come to mind, not a comprehensive list in any of the categories. 1. Three of My Favorite Knitting Podcasts. It's very likely you know all/some of these, but anyway, here you go. a. Little Big Knits - This is a fave because Selma, the hostess, seems to be a lovely person who knits really beautiful things and shares them from her home in Ottawa. She has a very calming effect, and also shares a lot about her family and her travels. This year alone, she had an episode where she showed a lot of her trip to Finland to visit her family, and her most recent episode is filmed in Uruguay, where she is visiting her husband's family. I just like her and think she would be someone who would be a wonderful friend if you knew her in person. b. Chevyrell - She may be the opposite of Selma (above), but I enjoy her podcast just as much. She lives in the US midwest (Michigan, I think) and works at a funeral home. She is hilarious, and goofy, and loves sharing her knitting and her life stories. She is definitely not everyone's cup of tea (or in her case, a cocktail or beer), but she cracks me up. Her stories about her life, her dogs, and what she is making and why are pretty much no-holds-barred. I feel like if you met her in real life, you would recognize her right away, and be assured of a good time. c1. 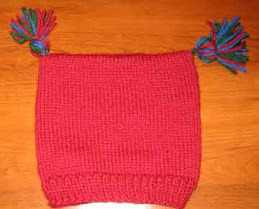 Sweet Tea No Shade - Scott and John are a married couple in Indianapolis, and Scott is a more experienced knitter. Their podcast is a lot of sharing about the things they knit, but also techniques and and patterns. It's also funny when their cats make an appearance, usually by walking in front of the camera, much to their dismay. They also have a good time laughing about Scott's mother, Betty Ann, who lives in the South and apparently always has a lot to say. c2. Janet Prue - Janet lives in Massachusetts with her husband and their two sons, and she is a really adventurous knitter, always trying new things. Her podcast is currently very small, but she is friendly and welcoming, and it's fun to see what she knits. **I know, I cheated with 4 instead of 3, so sue me. a. Cell phones - Well, OK, not them in and of themselves, I do understand why they can be a good thing. But I am really tired of how they are the center of existence for so many people. It's nearly impossible to have a conversation anymore with someone face to face without them constantly checking their phones, or even worse, taking a call in the middle of a conversation, when the call is not about their house burning down or their children being kidnapped. b. People Who Cannot Bear Cursing, but Use the F Word Several Times in Any Given Sentence - I know so many people who are such delicate flowers that they cannot bear to hear a curse word at all, and would DIE if their delicate spawn should be exposed to such. Yet these same people use the F word more than they breathe, I think. I do find it amusing that neither of my parents ever used the F word as far as I know, but they both did a lot of swearing. I mean, all the time. (Case in point: When I was little, before I could make my own breakfast, the first thing I would hear every morning from my mother would be, "Well, what the h*** do you want to eat this morning?") I swear/curse/whatever occasionally, and my sisters are the same. I never use the F word, and actually find it tiresome, and I think my sisters are the same way. And none of us are delicate, trust me. c. Stupidity - This one covers a lot. As in, just about anything or anyone. If people genuinely don't know/understand something, or have just not been exposed to things, then that's one thing - they can still learn and grow. But overall, general stupidity just makes me stabby. 3. Three Favorite Things I Like About Myself. a. I love words and language and hope to never stop learning whatever I can. c. I am incredibly loyal if I feel you deserve my friendship/love/support. I am willing to give everyone one chance at the benefit of the doubt, since no one is perfect. But once I decide you are someone I respect, I am incredibly loyal and will not ever share your secrets, will always defend you, and will always be there if you need me. Do you have favorites to share? Let me know! I had to stop listening to crafting podcasts because I would end up buying everything they are using and then it would just sit. I am so susceptible to a good sales pitch, intended or not. 2-c Stupidty Yeah, it happens. Some people are just not gifted with a lot of brain power and I'm okay with that. HOWEVER, to be PROUD of being ignorant? THAT drives me CRAZY. (And basically, it is this one woman at my knit group who thinks being "stupid about anything sports related (in this sports crazy city)" makes her smarter than the average beer-swilling Eagles fan. I am laughing and loving every word in this post! I'm with you on the cell phones! It's rainy here too. Yesterday was nice, but today is cold and dreary. My sense of humor is, er, unique like yours. Happily, my husband shares the offbeat humor tendency. We make each other laugh many times/day. Re: stash work. I find that I love handling the yarn almost as much as knitting it. It's all good! I don't listen to many podcasts (although I do have a few that I listen to on the regular) (although none about knitting!? ), and I've never WATCHED one. Knowing me (somewhat), if you were going to recommend ONE podcast for me to try, which would it be??? Totally agree on the stupidity. I feel the same way about facebook as you do about cell phones. And the two of them together...deadly. I am not fond of stupidity myself and actually love swearing. I am a big swearer and use whatever word seems appropriate at the time. And I have to say I am extremely loyal, but if you cross me or hurt one of my family you are severed from my life for all eternity. Now that I need to work on. Have a great week Bridget. When Briton and Hannah were young and began experimenting with expletives, my counter was that there are SO many words in the world --- why limit yourself to only a few? It worked then, but today, they both let s*#t FLY.